After replacing components relating to the vsc or performing "front wheel alignment adjustment", clear and read the sensor calibration data. Follow the chart to perform calibration. Clear the zero point calibration data. Operate the intelligent tester to erase the codes (select "reset memory"). 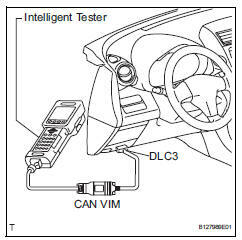 Using the intelligent tester, perform the zero point calibration of the yaw rate and deceleration sensor. If the ignition switch is turned on for more than 15 seconds with the shift lever in the p position after zero point of the yaw rate and acceleration sensor has been cleared, only the zero point of the yaw rate sensor will be stored. If the vehicle is driven under this condition, the skid control ecu will recognize that zero point calibration of the acceleration sensor is not completed and will indicate that there is a malfunction in the vsc system using the indicator light. Perform this on a level surface (with an inclination of less than 1°). Check that the shift lever is in the p position and apply the parking brake. 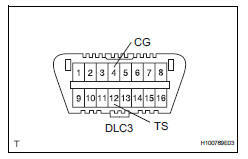 Dtcs c1210/36 and c1336/39 will be recorded if the shift lever is not the p position (see page bc-88). 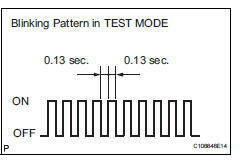 Set the intelligent tester to test mode (select "test mode"). Obtain the zero point of the yaw rate and deceleration sensor. Keep the vehicle stationary on a level surface for 2 seconds or more. Check that the vsc warning light blinks as shown in the illustration. If the vsc warning light does not blink, perform the zero point calibration again. 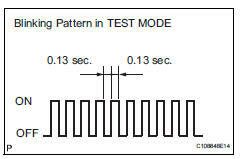 The zero point calibration is performed only once after the system enters test mode. Calibration cannot be performed again until the stored data is cleared once. The warning light and indicator light come on for 3 seconds to indicate that the initial check is completed. Using sst, connect and disconnect terminals 12 (ts) and 4 (cg) of the dlc3 4 times or more within 8 seconds. Check that the vsc warning light comes on. Using a check wire, perform the zero point calibration of the yaw rate and deceleration sensor. 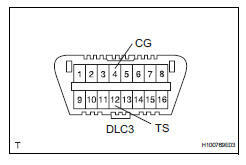 Using sst, connect terminals 12 (ts) and 4 (cg) of the dlc3.